What do we know about William Arscott? This page draws together some of the documents we’ve been using to discover his story, along with an oral history recording of another soldier who served with him in Salonika. We don’t know what he looked like but it’s possible he’s in the photo on the right which shows his Battalion during training near Bath. 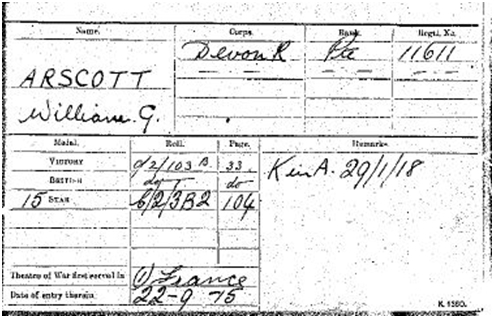 William George Arscott was born in 1892 and his parents were Thomas and Mary. He appears to have been known in the family as George and the family are recorded as living in Drewsteignton, Devon in the 1901 and 1911 censuses. In 1911 William George’s occupation is given as Farm Labourer, but soon afterwards he joined the local workforce building the nearby mansion named Castle Drogo. Research by the staff and volunteers at Castle Drogo has shown that his name appeared on the wages lists at that time. Work on building the Castle started in 1912, but began to slow down once war was declared in August 1914. During 1914 workers at the Castle, the single men in particular, were encouraged to volunteer to join the Army and some were paid extra for volunteering by Julius Drewe, the owner of Castle Drogo. This money covered the cost of the soldiers’ kit, which at that time they had to pay for themselves. W G Arscott made no further appearance on the wages lists after 14 August 1914, but his name is referred to in a letter held in Castle Drogo Archives dated 19 September 1914 by JC Walker who was the Clerk of Works. 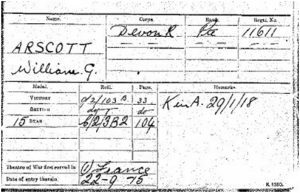 Like many other soldiers Pte WG Arscott’s First World War service record did not survive so it is not possible to say exactly when he signed up but it was thought to be in Exeter in late 1914 and he is recorded as serving with the 10th (Service) Battalion, Devonshire Regiment. 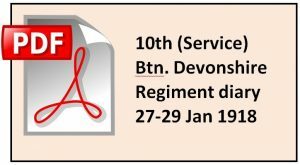 His Medal Index Card shows that he first entered the Theatre of War in France on 22 September 1915, but without his service record his military story can only be assumed to be that of a recruit in the newly formed 10th (Service) Battalion, Devonshire Regiment. The Battalion was formed at Topsham Barracks, Exeter on 24 September 1914 as part of Kitchener’s Third New Army (K3) and was posted to Stockton Camp, Codford St Mary on Salisbury plain where it became part of the 79th Infantry Brigade of the 26th Division. 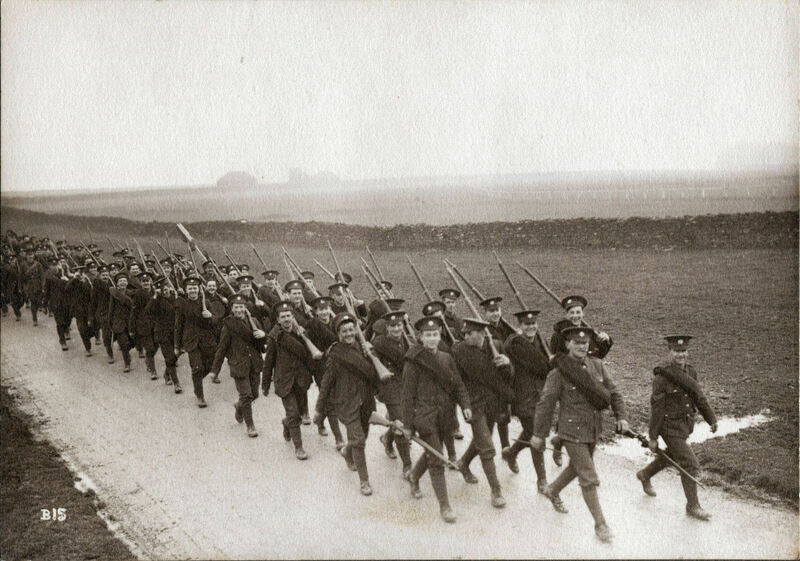 Pte WG Arscott and the other new recruits spent their first couple of months in training and living under canvas on Salisbury Plain although there were not enough weapons and uniforms to go round and even cutlery was in short supply. 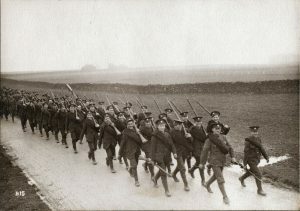 Many of the Devonshire recruits had to drill in their civilian clothes and improvise by using walking sticks instead of rifles. Fine weather gave way to rain and mud in November 1914 so winter refuge was found for the men in more comfortable billets in Bath. They remained in Bath until 20 April 1915 when the Mayor, the Corporation and local people gathered at a ceremony to wave them back off to Wiltshire again. By this time they had all received their uniforms and equipment. From Bath the Devons marched 21 miles to Sutton Veny which was a hutted camp near Warminster. There they began training with the other 3 battalions that formed part of the 79th Brigade with them, the 7th Wiltshires, the 12th Hampshires and the 8th Duke of Cornwall’s Light Infantry. His August visit would have been the last time that he saw his family home. As shown by his Medal Index Card he was to arrive in France with his Battalion by 22 September 1915. On 30 October 1915 the 26th Division, including Pte WG Arscott’s Battalion was redirected from the Western Front to Greece where the Allied Forces had just launched a campaign to rescue Serbia from invasion by Bulgaria and Austria. The troops left France from the port of Marseille and landed at the Greek port of Salonika (known today as Thessaloniki). Pte WG Arscott would have made this journey on either the battleship Hannibal or the transport vessel Ivernia arriving in Salonika on 21 or 23 November 1915. 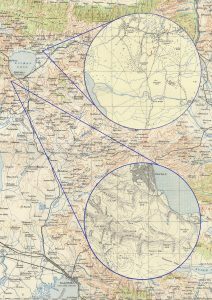 The Allies had been unable to prevent the invasion of Serbia so they retreated to the area around Salonika and a defensive line was created approximately 30 miles from the Bulgarian Front. This line was known as the ‘Birdcage’ because of the miles of barbed wire that was used in its construction. 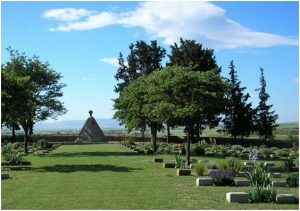 Pte WG Arscott and the other men of the 10th Devons were stationed at Lembet camp, approximately 3 miles north of the city of Salonika. They remained there from November 1915 to Spring 1916 living in bivouacs, tents and dugouts and spent most of their time training and road-building, with some trench construction on the front line at the end of March. During the heat of the summer in June and July 1916 the 10th Devons were on garrison duty in Salonika guarding mainly against fires but off-duty periods would have given Pte WG Arscott a chance to swim in the sea and explore the city. In late July 1916 the Battalion was ordered to advance north towards to the Greek-Bulgarian border which involved marching at night to avoid the heat. It took almost a week to reach Kalinova, south of the town of Doiran. It was here that Pte WG Arscott almost certainly saw his first enemy action against the Bulgarian army in late August. The men were also being attacked by mosquitoes and it was reported that by the end of September almost 250 men from the Battalion were hospitalised because of malaria. Fortunately there were few deaths from the disease but their illnesses and absences made it even more difficult for the Battalion. The Battalion moved on again on 25 October 1916 and marched about 8 miles east to relieve the French troops on a hill they had named La Tortue, the Tortoise. This hill lay directly across a ravine from Petit Couronné, a significant heavily fortified hilltop position in the Bulgarian front-line. Pte WG Arscott and the others remained here for 6 months, alternating with the 8th Duke of Cornwall’s Light Infantry, spending 8 days at a time in the firing line and intervals in reserve. At times the weather was wet as well as cold and sometimes the rations were scarce but it is recorded that on Christmas Day 1916 the men of the Battalion enjoyed a traditional dinner of Turkey, Roast Beef and Xmas pudding. The 10th Devons were selected to take part in a trench raid to test the Bulgarian defences and this took place on Petit Couronné during the night of 10-11 February 1917, after being postponed for 24 hours because of heavy snow. The raid undertaken by the Devons was a battalion size attack aimed at destroying machine gun and trench mortar positions and any large dugouts that could be located. Although well-established on the hill by 2230 hrs, the Battalion could make little headway towards their main objectives. Suffering numerous casualties, low on ammunition and with increasing numbers of enemy infantry arriving on Petit Couronné the Devons retired in the early hours of 11 February, taking 100 wounded with them. April saw the Devons being involved in a significant action. On the night of 24-25 April 1917, the 10th Devons again attacked Petit Couronné, this time as part of the 79th Brigade assault, and what was to become known as the 1st Battle of Doiran. 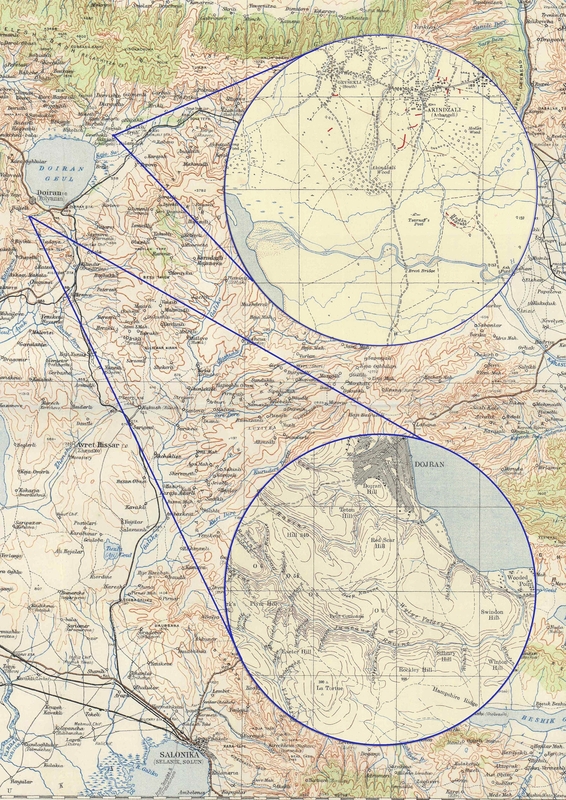 Unlike the raid of 10 February, the April offensive took place over several miles of the Doiran Front and was carried out in force. For the Devons the target was the same, Petit Couronné, but this time their objective was to seize it, but without any reinforcements the Devons were eventually forced to retreat. On 26 April 1917 the remnants of the Battalion marched to the Dova Tepe sector on the slopes of the Krusha Balkan Hills, 8 miles east of Lake Doiran. 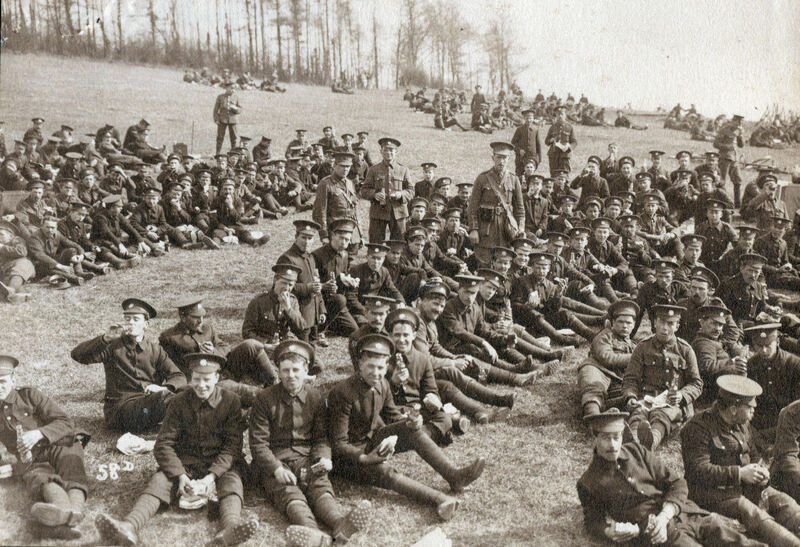 The Battalion was brought back up to strength by bringing in drafts of men from other Regiments. Towards the end of August the Devons were on the move again and having marched at night and rested during the day, they reached their new position in the Krusha Balkan Hills, where they watched over the far distant Bulgarian lines. This move brought them close to a village called Akindzali, held by the Bulgarians but raided by the Devons at least once a month. This would ultimately prove to be significant for Pte WG Arscott. With forces stretched on the Western Front, Britain and France were unable to commit the extra resources required to make a decisive strike in the Balkans. Meanwhile the Bulgarians appeared content to wait for the War to run its course elsewhere, so military stalemate set in. The Devons therefore had a quiet end to the year, celebrating Christmas 1917 as before but many were saddened to lose their mail from home as a large parcel mail transport vessel had been sunk in November. 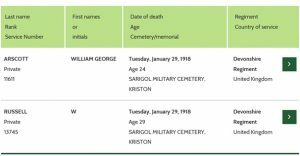 Although the 2 men killed are not named in the War Diary, Pte WG Arscott and Pte W Russell both of the 10th Devonshire Regiment were killed on that day and are buried in the Sarigol Military Cemetery in Kriston, Greece, as shown in the Commonwealth War Graves Commission database. 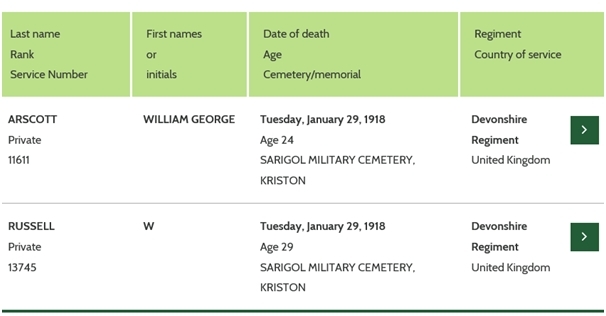 Pte WG Arscott would have been buried on the battlefield in a nearby military cemetery and it is known that the graves of the men killed in action and buried in Janes Military Cemetery were later removed and reburied in Sarigol Military Cemetery in February, 1921. The 10th Devons remained in the Balkans until the end of the War. They did not take part in the Second Battle of Doiran in September 1918, but were there as the Bulgarian Army capitulated and the war in Salonika was finally over. The Western Times, February 15 1918 reported Pte WG Arscott’s death and also provided information about his character, his activity as a bell-ringer and his mother’s death. The following two sources add further information and background detail. 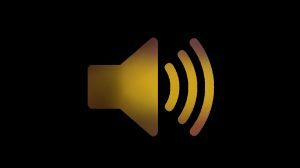 The PDF describes the action in which William George Arscott lost his life, and the audio icon links to an oral history recording of Private Ernest John Blank, who was with Arscott in the Devonshire Regiment in Salonika.